100% of this wrap was created from Island Farm sheep's wool. The gorgeous gray wool is from my beloved Corriedale sheep, Izzie, and the white wool is from my favorite Romney sheep, Ruthie & Bea. 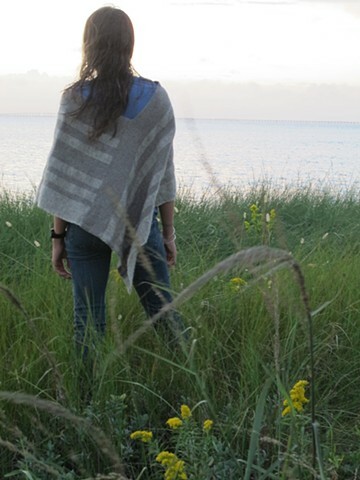 This wrap was woven in a "bird's eye twill" pattern, that subtly peeks in and out of the gray and white wool. I wanted to create a wrap that was easy to wear, could be thrown on in a snap, and this is it. I liked this piece so much that I kept one for myself.